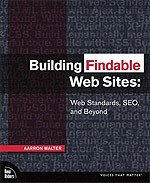 A few years ago, Aarron Walter wrote a great book on building findable websites. This is both a review, and since a second edition has yet to arrive, a few points around relevant technology that has been introduced or refined since the book was first published in 2008. Knowing my penchant for semantics and SEO and other best-practice doohickery, my co-worker Jill has been recommending Aarron Walter’s book Building Findable Websites for some time now. I purchased a copy for our wed dev department, promptly called first dibs, and spent the next two weeks diving into the pages of its unassuming black cover. Is Aarron’s book good? Yes. Does it do a good job of covering the basics of making a website more findable? Of course. Is it easy to read, easy to put into practice, and delivered with confidence and a clear voice? You betcha. But does also it have a few annoying nettles that maybe dilute the purity of the message? Unfortunately, yeah. And finally, even though it was published in 2008, does it need a refresh? On a few key points, absolutely. This is part review and part article. Aarron has written a strong and relevant text, but web technology is moving so fast these days that dead-tree format brings both prestige as well as the risk of painfully dated content. So I’ve commented on the book as it is, and offered a few comments on the technology and tactics as they stand today. Markup Strategies is a by-the-book primer on the virtues of web standards. It covers the benefits of lean markup, paying attention to accessibility, what metadata to implement, and the sweetness of microformats. In other words, it’s 35 pages covering stuff of which anyone reading this site already understands the value. Server-Side Strategies covers best practices that have to be implemented through server-side code. This includes how to build good 404 error pages, constructing 301 redirects, making content indexing more efficient through caching and compression, and using YSlow to diagnose problems. Creating Content That Drives Traffic discusses the value of content in a findability strategy. Aarron provides good examples of “evergreen” content that brings in links, and incorporating outside content like link lists through RSS feeds. He also covers keyword research and keyword density, an important pillar to a good SEO campaign. Building a Findable Blog covers all of the ins and outs of constructing and writing a blog that gets found by humans and search engines. The topics are diverse and relevant, even if they occasionally repeat other parts of the book. Adding Search to Your Site is a primer on adding free and paid search services, or constructing your own. Bring Traffic Back with a Mailing List is true to its title. It walks through the benefits of a mailing list, taking advantage of a list management system, and constructing a basic Ajax-fueled registration form with MailChimp. Putting Findability Into Practice is the shortest of sections, but perhaps the most valuable. Aarron details a list of all the tactics discussed in the book, and orders them by priority — a great asset for marketers. He also provides some great tools site builders can use to troubleshoot and improve the property. Overall, the content is very strong, and he delivers a consistent message about the importance of best practices in web development to facilitate sites that can be searched, indexed and found. Building Findable Websites suffers from a few nuisances that are not unique to the book, but are still annoying. First, the entire book assumes the reader is using Apache, PHP and MySQL. While this combo is as common as dirt (hell, I use it), it is disconcerting to find pages of SQL syntax and PHP code, which scarcely a mention of IIS, .NET, Rails, Python or any other valid technology. I understand this is the expertise of the author, but even simple stuff like implementing 404 pages can be extended beyond a line of .htaccess code. Second, the screenshots and examples of good findability in practice are largely limited to a who’s who in the industry: Jamie Huskisson, Garret Dimon, Dan Cederholm, the Blueprint CSS framework, Smashing Magazine, Happy Cog, Andy Rutledge, Jonathan Snook, Shaun Inman, Dave Shea, Jesse Bennett-Chamberlain, Bartelme Design and Sitepoint. Actual, real businesses using these techniques are simply not represented. This means the techniques are so cutting edge that only “famous” designers use them on their own sites, or Aarron simply did not research good findability outside the inner circle of high-profile web design conference speakers. Either way, it’s annoying. I am sensitive to both of these issues, because when I wrote my book, I went out of my way to find examples of business websites “in the wild” to illustrate my points, because that was my target audience. I cannot imagine Aarron’s target audience is Jeffrey Zeldman and Jeff Croft and whoever else, but that’s what it reads like. Findable websites will ultimately need to use HTML5 markup and hopefully reduce class and ID soup with more meaningful tags like <article />. I wrote about this last year after Google’s announcement for supporting explicit data structures. It is clear that the markup of the future must be ever more detailed and descriptive, because devices are using that data to tie into actual services. Resumes, calendar events, reviews, location information, and more can all be leveraged when written with well-formed markup. This is the definition of findable content. Aarron covers XML sitemaps on one page, which, at the time, was about all you could say. Over the past few years, it has become clear that these are important for every site to help ensure its content gets indexed thoroughly. The original spec was for written content, but sitemaps can also be used for media like photographs and video. I did not read the book, but this summary represents the core point. First build a good website then make good off-page optimization to make it findable. I wonders about off page optimization cases.